6 Who’s Got The Girls ? There are two kinds of sadness concealments in what sounds like a happy song. One comes from the lack of security that results in resting one’s head in the warm bosom of catchy songs. The other one, the one that I can sometimes find in Raymonde Howard’s music, for instance, is the one that comes from full understanding of the medium, and a full awareness of one’s music output. The joyful album, titled “For all the bruises black eyes and peas” is cleverly layered with this self aware irony, for example on the song “Great minds think alike”, which makes it a more interesting album in deeper listens, after the first impression was established. Laetitia who stands behind Raymonde Howards, uses guitar loops in order to create a rich world for her powerful singing. “The raincoats are here” proves this point, as the singing, while still retaining a sweet taste to them, sound severe and demanding. In my opinion, this song is one of the best songs on this album. It is followed by “Song to shoot him”, that reminds me, in a way, of old Nick cave songs. It is very short, lasting a little less than one minute, but it’s still wonderful. 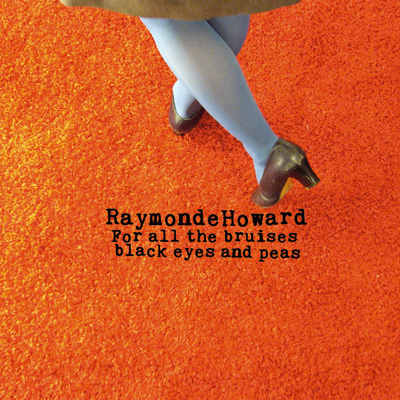 Overall, this nice, even if short album is a really good way to get to know the work of Raymonde Howards, as it shows several faces of the artist while keeping it interesting and to the point.